Anders Lindegaard believes Nick Pope has been the best English keeper in the Premier League this season. But he is honest enough to admit half of him wishes the former Charlton man hadn’t enjoyed the remarkable rise to prominence he has had - giving the Dane another chance in the top flight himself. Lindegaard signed a new contract yesterday, extending his current deal to the summer of 2019, having arrived as a free agent after Tom Heaton dislocated his shoulder in September. Lindegaard brought experience of the highest level, having spent five years with Manchester United, and a season with West Brom, while he has five caps for his country. The 33-year-old thought he was very much in the frame for the jersey, but Pope, untried in the Premier League, has revelled in the opportunity. Lindegaard said: "I have to admit, when I signed I found myself in an optimistic situation. "Nick Pope had just played a couple of games, he'd never played (in the Premier League) before and I would be lying if I didn't say there was a big part of me hoping that he wouldn't succeed to the extent that he did. "I saw myself having a chance to go in and play regular first team football for Burnley. "He won't get shocked when he reads that! "I am very honest in those terms. "I came here to play. I know there is another dimension, I have other roles than just sitting on the bench on a Saturday or whatever my function is going to be when we have a game. “But I want to play on a Saturday, like everyone else, and I don't see any point in hiding that. "Definitely we've got a goalkeeper's union, but we all want to play." Lindegaard can have no complaints, however, at his watching brief, with Pope statistically among the best performers in the Premier League this season: "Nick has done fantastic from the very first day I've been here. "He almost hasn't made an error all season, and it's not coincidence because he does it every day in training as well. "For me I think he’s been the best English goalkeeper in the Premier League this season and it was very well deserved that he got a call-up for England." Heaton is expected to return to the squad at Watford tomorrow, meaning Lindegaard could drop further down the pecking order. 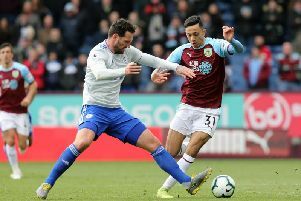 But he is happy with life at Turf Moor and fully understands the situation: “From a professional point of view, I would be tempted to go and play. I’m not in football for the money any more. I think we all are or have been at some point in our career, but for me there are (personal) reasons why I want to stay here. "I have a son who goes to school in the Manchester area and I want to stay here as long as he's in school so it’s very important for me to stay here. It's what I've been working hard for since the day I came. "Professionally it's very good here as well. "It's a great group to be a part of and we’re not killing each other to play on the weekend. "There’s just a good positive atmosphere among people who want to push themselves and also each other as much as possible."